Fear isn’t funny, and we all know it. Cartoonist Doug Savage, however, started me on this post. Thank you Doug for two great cartoons about fighting fear. Systematic desensitization is a tool used by Behavioral Therapists; they prefer action to talk. They use two tools in combating fear. The first is called flooding. I wouldn’t suggest using it with your kids as I think it is cruel. Flooding in the case of spiders would mean locking your child in a small space with thousands of spiders and leaving him or her there until habituation sets in. Habituation is the trait of getting used to anything if exposed to it long enough without being able to escape. Actually when I suggested in a recent post about separation anxiety that parents just leave their crying child, that was a form of flooding. I prefer to think of it as cutting the agony short. All teachers and baby sitters know that once Mom or Pop depart, the kid gathers courage and invests in distraction ploys. One other thought about flooding: the fascination older kids have with horror movies is a form of habituation. Not only do your flood yourself, but at movies end, you get a survivor’s rush. Anyway, on with Systematic Desensitization. First you have to strengthen the ability to self-sooth. See my post on Right Breath and also visit My Emotional Fitness Easy Lesson Page. Both teach self-soothing skills. 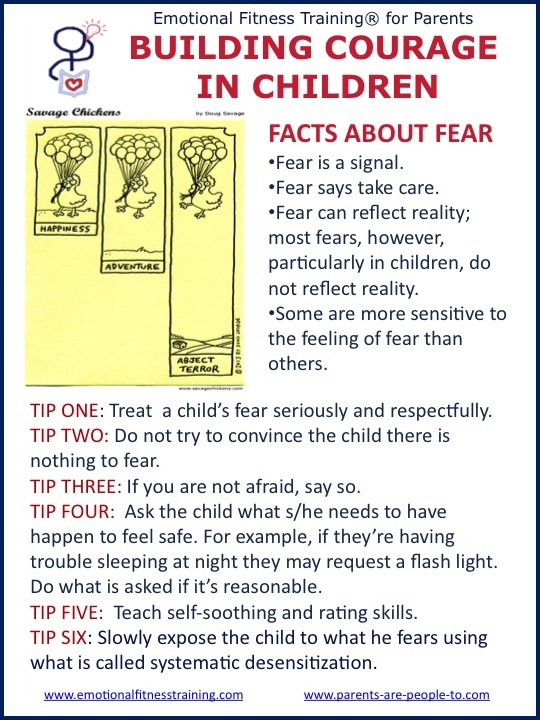 Then the child needs to be able to rate how scared he or she is. No fear, something to fear looming on the horizon, itty-bitty fear, hearting-beating-faster fear, screaming out loud fear, running away fear, or dead faint fear. One reason for the rating scale is so the child starts thinking instead of just reacting. The second reason is to start self-soothing before the fear takes over. Related to this is need to signal the parents when the kid can’t manage on his or her own. As a crisis team manager in NYCity during 911, I did a lot of crisis debriefing. The training did emphasize re-telling the story, but that was soon seen as re-traumatizing some. First teaching and strengthening self-soothing skills and then teaching rating scales put the “victim” in charge. You do not want your children to feel helpless and victimized. The combination of self-soothing and rating increases the child’s sense of control and increases courage. Genes play a part in reactions to scary events. The experts say there are shy kids, slow to warm up kids, and bold kids. Guess what? The same rating applies to adults. So if you have a shy kid, chances are somewhere in the family mix are shy genes. Yours? Then you need to build your courage, so you can model calm. Sorry, but that is the way it works. As always remembering what matters keeps you and your children on the path to the good life and combats fear. My Twelve Easy Emotional Fitness Exercises keep you on that path, and are the foundation of a strong self-soothing program. I am grateful for all you do to keep me strong and hope this is a post you can share with some one who will find it helpful. This entry was posted in Parenting Issues and tagged building courage in children, Creating courage, Emotional fitness, emotional intelligence, fear, flooding, Katherine Gordy Levine, Parent advice, parenting, parenting teens, postaday11, systematic desensitization, teaching your child courage. Bookmark the permalink.